Even though every separation is unique, most people who go through a separation and divorce can expect to face the same 6 stages as they work towards a resolution. “All happy families are alike; each unhappy family is unhappy in its own way.” These classic words begin Leo Tolstoy’s masterpiece Anna Karenina. Research1 reveals that most people’s separation experience is actually remarkably similar. Instead of following a unique path to divorce, most separating couples pass through the same 6 stages in their divorce journey. So, what should those just beginning their separation journey expect? And what is there to learn from the experience of others who have travelled the same road? The end of a marriage is one of life’s significant losses, so it should come as no surprise that devastation, shock and grief follow hot on the heels of the separation. If this is where you find yourself, you probably want to bury your head in the sand rather than face the reality of the break-up. It’s so much easier to put off the pain and lick your wounds than to try and deal with the realities of the divorce. And even if you wanted to deal with the practicalities of the separation straight away, most people don’t have the focus or headspace to deal with it immediately. In fact, it’s not unusual for this grief to last several months. You may find that you take 3 steps forward followed by 2 steps back. At times you feel ready to move on, then a switch flips and suddenly you’re not ready to move on. Eventually, though, you’ll process the emotional trauma of the breakdown. It may be 6 months down the track; it may be 9 months down the track, but the time will come where you find the resolve to move forward. You finally start to think about what life might look like in the future. Having navigated the waters of the initial grief and shock, the second stage is more positive. Of course, that doesn’t mean there isn’t sadness, or that things are somehow all better, but you feel as if you are ready to move on with your life. For most most people on this journey, a discussion about the best way to go about the separation is next. Hopefully, you’ve agreed that you’re going to do this amicably and behave respectfully toward each other. It’s common for couples to explicitly agree from the outset that they will not involve lawyers (often not a good idea, but more on that further in). And for those with kids involved, there’s extra motivation to get through the divorce with a workable relationship intact. ­Whatever the situation, this second stage involves a resolution to move forward with the separation, usually with the intention of finding a collaborative, amicable way to divorce. In an attempt to follow through on the resolution to move forward with the separation, an Internet search is the almost universal tool to hunt for information about the best way forward. Unfortunately, this positive energy tends to fade quickly. There’s too much information, and most of it is either incomplete or unclear. It’s easy to feel like a victim of someone’s SEO strategy. Besides, who wants to trust their future to the advice of unknowns on the Internet? It would be alright if there was a sequence of practical steps that could be followed. But there aren’t. And the lack of clarity, the lack of knowing what to do next, inevitably leads to frustration and conflict. The initial sense of good will and optimism erodes as even seemingly small conflicts create an environment of helplessness and despair. If there was a checklist or something it would help, but there doesn’t seem to be any positive stories out there. And even though you know you’re not the first person to go through this, it feels like you’re just making it up as you go along. In the absence of definitive advice, proactive people often create a spreadsheet proposing how to divide the assets. Most of the time, this either gets ignored or picked apart, and the conversation breaks down. These conversations are surprisingly difficult, even for mature, amicable couples. It’s one thing to know that key parenting and property issues need to be sorted, but another thing entirely to sit down and actually have the conversation. And whether it’s the fear of not reaching a fair outcome or some other fear, something keeps people frozen and unable to talk things through. 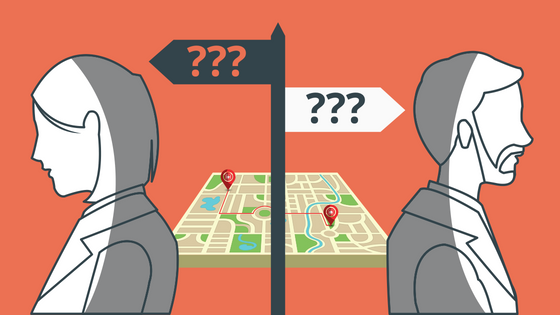 In an effort to get somewhere—anywhere!—it’s likely that one of you will eventually seek some direction from a lawyer. This can be far more difficult than it needs to be, particularly if you agreed – like many couples do – that you wouldn’t involve lawyers. Be open about this as your ex may see this as an escalation of conflict and a betrayal. It’s common for the other person to feel as though they’ve been forced to ‘lawyer-up’ themselves. This is really unfortunate, as independent legal advice is a must for couples with any amount of assets. Most people don’t understand how the family law system works, and in their desire to avoid lawyers, one person is often severely disadvantaged as a result. At this point, some couples find themselves sliding into an adversarial process as their lawyers begin to exchange letters and direct communication between themselves becomes difficult. For many others, we see a tendency to pull back. Accessing legal advice brings with it a complex web of relational, cultural and financial issues, so many people end up pulling back, withdrawing from engaging a lawyer. We hear a range of reasons that people do this: the tone of the conversation, guilt about ‘betraying’ their ex, the prospect of conflict escalating, and the potential cost are common reasons people cite for having an initial consult and then not proceeding with a lawyer. After seeing a lawyer and pulling back, the hoped-for assurance and direction is lacking. The way forward seems dark and unsure. But as we’ve seen so far, the intention to keep things amicable doesn’t make the journey smooth, and in the absence of any alternative plan or way forward, most divorcing couples find themselves in the sixth and final stage: limbo. At this point, separating couples have few options. It’s a state many describe as limbo. There’s no resolution with a parenting plan. There’s no resolution with property. Both parties want to move on with their lives, but neither party can. And to cap it all off, there’s no short-term prospect of doing so. It’s like living in a holding pattern. No one travelling on an aeroplane wants to get stuck circling the landing strip for hours, but that’s what it is to live in limbo. It’s not even that life is unbearable; just that there’s no end in sight. You want to know what you’re doing, you want to be able to move on with life. But you feel stuck. The kids need certainty. You need certainty. And there’s always the fear that the other person might become acrimonious, that things could go pear-shaped. It’s like you’re stuck in a maze. You know where you are now, and you know where you need to end up—and it’s not even that far away—but you have no idea how to get there. That’s what it is to be in limbo. 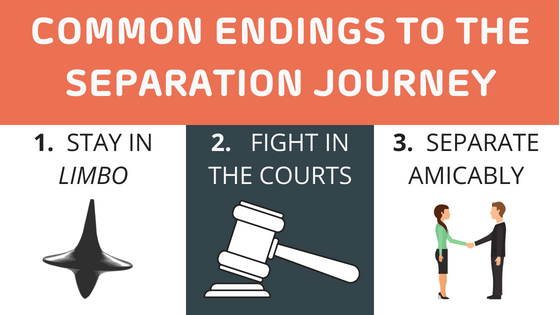 Just as there are common stages most divorcing couples go through, there are common endings to the separation journey. The holding pattern solidifies into normal life, with one partner likely to be worse off. This is usually the woman, who has taken a larger share of the child care and—due to the lack of advice from a third party—has not been compensated according to the provisions in the Family Law Act. As there is no formal settlement, the arrangements will probably be altered at some point in the future. This usually happens once there is a re-partnering. Another common ending is that the relationship deteriorates until one of the parties starts legal proceedings and forces the issue. A settlement is either negotiated through lawyers or determined in court. The final and most positive outcome is that, against the odds, the couple work through everything together. A solicitor then draws up an agreement and formalises the settlement. Unfortunately, this is the exception rather than the rule. With the majority of divorcing couples pass through the same six stages—and endings—is it possible Tolstoy was wrong? After all, it seems that those experiencing separation and divorce are not unhappy in their own way, but are very much alike. And what about those wanting a better outcome? Is there a different path to travel—one that won’t end being trapped in limbo? To help more Australians achieve a better ending to their separation and divorce journey, we created a collaborative divorce platform called Adieu. 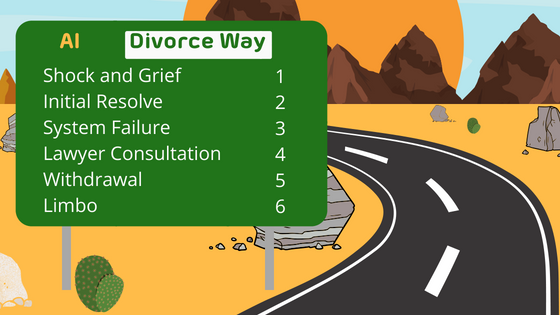 For a fixed price, you get the support, resources and advice you need to help you navigate every stage of the divorce journey. At the end of the process, you’ll have a legally-binding financial settlement that’s fair to both parties and, if there’s children involved, a parenting-plan approved by the courts. Find out how the Adieu process keeps you out of limbo and moves you forward in your separation and divorce so that you reach a quick, fair, amicable ending to your divorce journey.